Young snowboarder heliskiing in stunning British Columbia during active holiday. 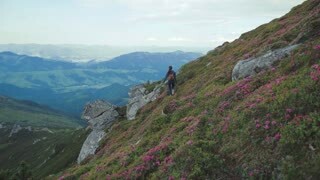 Pretty young woman wandering in the flowered highlands, comes to the mountainous peak, jumps on it, and enjoys the stunning view. Hobby, active lifestyle. Cheerful mood, positive feelings. 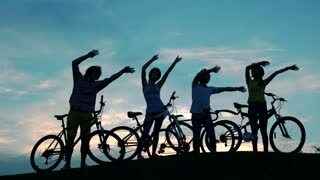 Cyclists waving with hands at sunset sky. Group of young cheerful friends spending holiday riding bicycles. Active and healthy lifestyle. SLOW MOTION: Active young man on holiday jogs in the wet sand along sandy beach. Guy riding bicycle on the road. Young cheerful man cycling on country road, sunny day. Active summer holiday concept. VERTICAL: Freeride snowboarder on active vacation shredding pristine snow. VR360: Snowboarder shredding the un-groomed snowy mountain in British Columbia.